Chinese online stars "wang hongs" appear in Seoul! A wang hong refers to an internet celeb having millions of followers in China. Two of them visited Seoul and had a great time experiencing K-Culture. Now let's check out their exciting stories. Wang Hong on the rise! 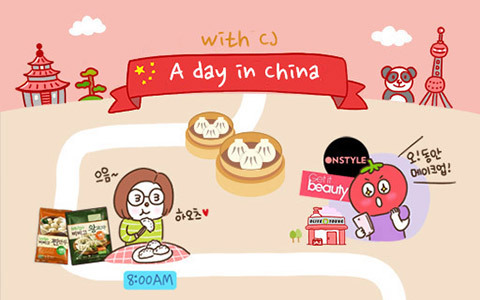 Wang Hongs, internet stars in China, play an important role in the spread of K-Culture. K-Culture sensation in China is really strong at the moment. Chinese people are not only thrilled over K-Music and K-Drama, entertainment cultures that have laid the foundation for the birth of Hallyu, or Korean wave, but they are also becoming enthralled by Korean lifestyles such as K-Beauty and K-Food. And the role of wang hongs, internet celebs in China, was indispensable in this popularization of K-Culture. Boasting of millions of followers, they introduce new K-Beauty or K-Food items to young Chinese people who are sensitive to trends, exerting huge influence on them. Wang hong is a combination of Wang (internet) and Hong (celeb), which refers to an internet celebrity. It is a new coinage referring to an internet star having at least 500,000 followers on social media. 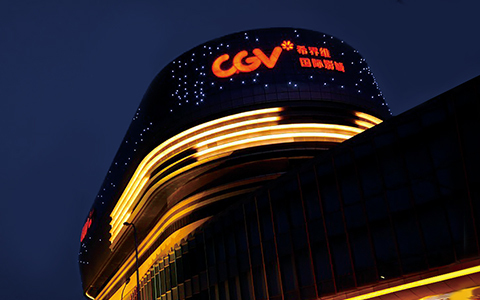 With the growing influence of them on the economy in China, an addition term of "Wang Hong Economy" has emerged. China's iconic fashion/beauty wang hong Shaxiaocaca, who has a million followers to her name, and Lin Feng, who also has a million followers behind her, representing China's new consumer generation, Jiulinghou (born in the 90s), joined this Fellowship of K-Culture and thereby underscored their significance. Shaxiaocaca (www.meipai.com/user/1059709) is a BJ (broadcast jockey) who provides detailed information on makeup ranging from fashion styling to cosmetics review and makeup insights. She is an extremely popular K-Beauty makeup wang hong and tends to tally over 10,000 comments per uploaded video. Lin Feng (www.meipai.com/user/20228557) rocketed to a star BJ with her K-Music cover dance posts on her blog as she specialized in dancing. Ling Feng is a powerful K-Music dance wang hong with her K-Music dance cover recording around 100,000 views per video. She is interested in overall K-Culture as well as K-Music. Now let's take a closer look at how these wang hongs embraced K-Culture in Seoul. Having strong interest in beauty, she started a special K-Beauty tour in Seoul in her own style. She tried various K-Beauty products and delivered a review to her followers via live broadcast. 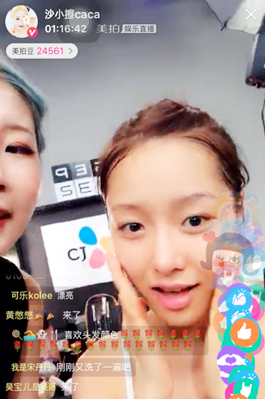 Saying that she puts in a great deal of care of her skin for her beauty broadcasts, she tried out products of Innerb, CJ CheilJedang's No.1 inner beauty brand. In particular, she took a rest from the fatigue of her journey by supplying some nourishment to her dried skin with Innerb Recovery Hyalutox Patch. As Innerb Recovery Hyalutox Patch is an intensive care patch that supplies sufficient moisture to the skin with its approximately 1250 "micro projectiles" of nutrients smaller than the size of a pore, it became a perfect item for her travel. Innerb Patch for her followers. Shaxiaocaca is savoring simple K-Food such as Hatban Cupban at Yongin Speedway. She visited Yongin Speedway, Korea's first racing circuit, and performed a broadcast demonstrating K-Beauty makeup that effectively blocks out hot sunshine and that also goes with super-race look with a super race model Han Rina, resonating with consumers in China. She also tried the functional and tasty Bibigo's Cupban Hatban and seaweed snack that you can enjoy simply even in the open air. The tireless, passionate wang hong also visited CJ O Shopping, the center of shoppertainment, and conducted a live broadcast while there. Taken with CJ O Shopping's PB cosmetics "SEP Clay Cleanser", she introduced the product and received positive responses from her followers. She said in her review, "As I tend to have a sensitive skin, I always carefully check the ingredients of cosmetics. It was nice that the green clay from France cleanses away waste even from the pores." Lastly, she visited O’live Young, the hot K-Beauty place. She looked upbeat when she visited the store, saying "I like this place as I can see many quality products of reasonable prices all assembled together….I like visiting O’live Young as I can get a sense of the beauty trends of Korean women." She is watching CJ Innerb Pack. Interested in overall K-Culture as well as K-Music, Lin Feng had a short but great K-Food experience in Seoul. The place she visited first after she arrived in Seoul was N Seoul Tower, where in < My Love from the Star > Cheon Song-Yi and Do Min-Joon pledged eternal love through the famous ‘couple locks’ of the tower. 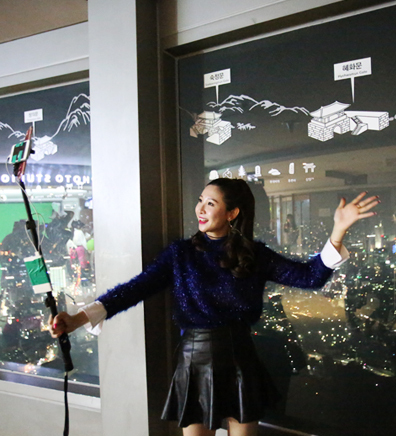 She visited the famous sky restrooms on the fourth level of the tower and also enjoyed the observatory on the top level. Then, she visited the 360-degree turning restaurant "nGRILL" and also dined on seafood hot pot with abalone at HanCook, a Korean restaurant. Of course, Ling Feng, who primarily visited Seoul to experience K-Food delicacies, didn't skip Season's Table, where she could have a functional meal made of fresh seasonal ingredients. She said while in Season's Table at N Seoul Tower, "The meals are very Korean and I definitely feel myself getting healthier with each bite." 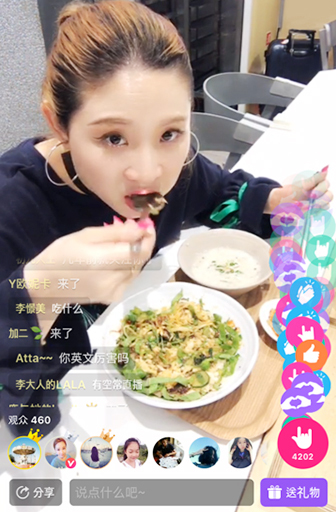 She carried out her live broadcast while enjoying some spicy stir-fried chicken with mild taste and grilled pork neck. and showcased the beautiful nightscape of Seoul live. Then, she visited the BOYS24 Hall in Myeongdong and experienced the K-Music scene there and introduced a new K-Music spot to her followers. The BOYS24 Hall, where you can see the contest of < BOYS24 >, a mega K-Music project of CJ E&M, is a unique space that showcases the real-time process of creating K-Music to foreign fans. 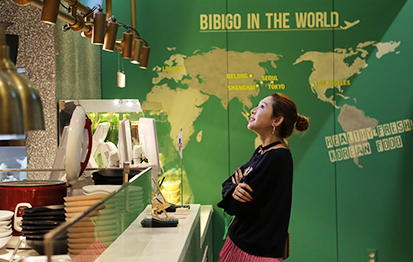 After that, she visited Bibigo, a Korean fast casual restaurant, on the first basement level of the crowded Seoul Square and got a glimpse of the popularity of Bibigo, a global Korean food brand that operates 11 stores in China. She felt captivated by the fast casual restaurant where customers can be instantly served with food after placing an order just like fast food and, at the same time, enjoy wholesome meals made of fresh functional ingredients. She also recommended to her followers, "Bibigo Rice", a functional salad-based form of bibimbap, as a meal good for a diet. 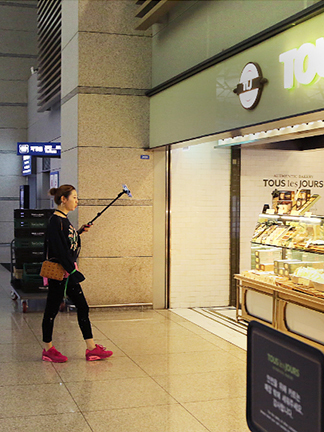 The last place she visited in Korea was Incheon International Airport. In CJ Airtown where one can experience K-Music and K-Culture in a single place, she visited Bibigo, Tous Les Jours cafe and A Twosome Place, capping off her Korean delicacy tour. 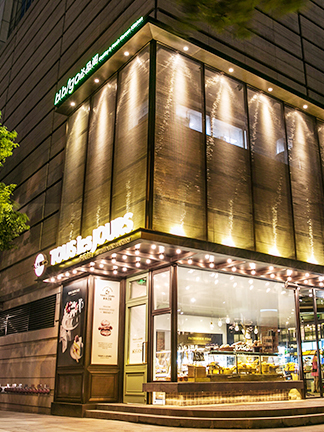 "As the Tous Les Jours cafe is located in the departure lounge on the third level of the airport, you can form a nice memory until the very last moment of your journey in Korea," she said. She felt sorry that her journey was about to come to an end but she was able to soothe the feeling with a sweet dessert. This healthy, beautiful and young K-Lifestyle in Seoul was showcased live to millions of followers through the broadcasts of these wang hongs. It was a truly memorable time when these wang hongs, who exert a huge influence on Chinese youths with their trendy tastes, experienced K-Music, K-Food and K-Style, in company with CJ and derived a better understanding of K-Culture. K-Lifestyle to her followers in real time.